Ok, enough already with the Christmas/holiday bickering. This society has gone way too far with what to call this season. The latest on the news regarding a Jewish Rabbi complaining in an airport about some Christmas trees just about makes me want to scream! First, let's get it straight America, the Christmas tree does not hold any biblical reference! Nor does it have anything to do with Christ's birth. There were no Christmas trees present in the Nativity! The Christmas tree, though it may have some Christian symbolism probably sits in the homes of more nonbelievers. Therefore, what is the BIG deal? Seriously, some people need to stop being so sensitive! 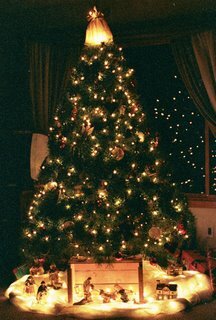 Check out this site about the history of the Christmas tree. In the meantime, Merry Christmas!!! Merry Christmas to you, Lynzee. May the joy of the season enter our hearts everday. In the eyes of children, all Christmas trees are 10 feet tall!